The system works all year round, though you’ll need to heat the water further with a boiler or immersion heater during the winter months. 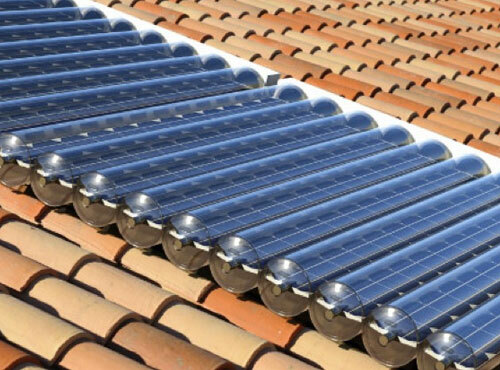 Solar hot water is a green, renewable heating system and doesn’t release any harmful carbon dioxide or other pollutants. 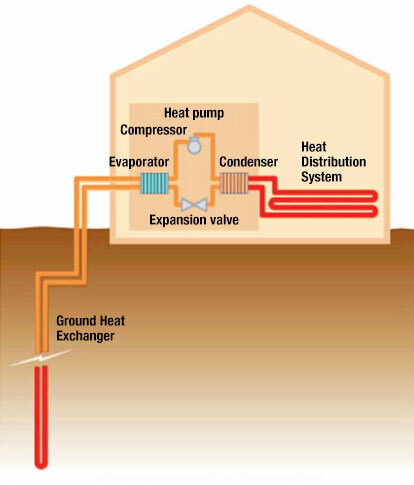 A recent growth area in electrical heating is ground, air and even water source heat pumps. They can be up to 300% more efficient than a conventional boiler. GSHPs are the most popular and efficient. They work on the principle of making the ground colder while making the home warmer. They do this by running a refrigerant fluid through pipes that are buried in a trench or a borehole, while delivering warmth at a heat exchanger indoors. That heat is transferred to the water running through pipes inside a house to warm radiators and provide hot water. Ground source pumps are comparatively more efficient than other heating technologies with a CoP (performance coefficient) of 3:1. This means that they use one unit of electricity to pump out three heat energy units. 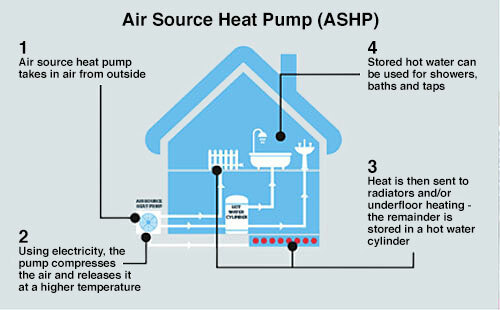 However, as compared to an air source system, ground source heat pumps are expensive and require specific installation. Could lower home carbon emissions, on average a ground source heat pump could save around 540kg of carbon dioxide every year when replacing an oil boiler. 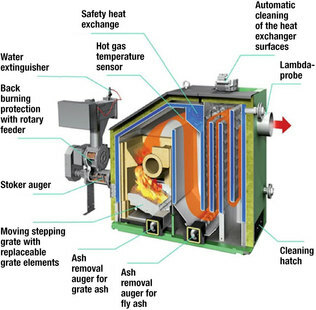 Biomass is the word used for the wood material (wood pellets, chips or logs) used for heating. It is an environmentally friendly way of heating your home and can be considered as carbon neutral. Burning wood releases the same amount of carbon dioxide to the atmosphere as it would if it was left to decompose on the floor, the trees then absorb that carbon dioxide and the cycle is repeated. If you have to buy wood that has been transported considerable distances then it’s no longer zero carbon. If you are choosing to burn wood then it’s important to ensure that it is completely dry – if the wood is high in moisture or damp and wet it can cause tar and smoke. This tar and smoke has the potential to harm your flue. Solar gain and thermal mass are of course free, but capturing it may require major refurbishment. 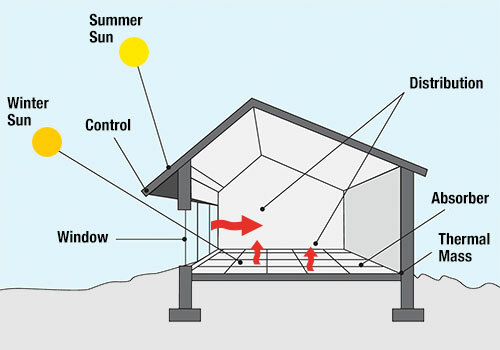 Some advanced eco-homes rely on super-insulation and heat coming from sunlight, occupants in the home and heat as a by-product of using electrical equipment. 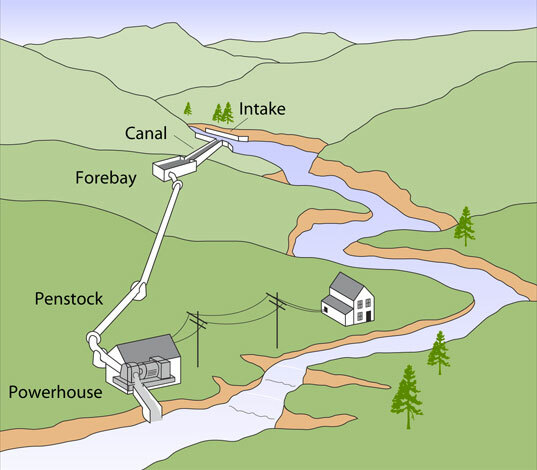 Hydroelectricity is green, renewable energy and doesn’t release any harmful carbon dioxide or other pollutants. Micro hydropower system diagram. With some systems the generator can be placed directly in the water flow.